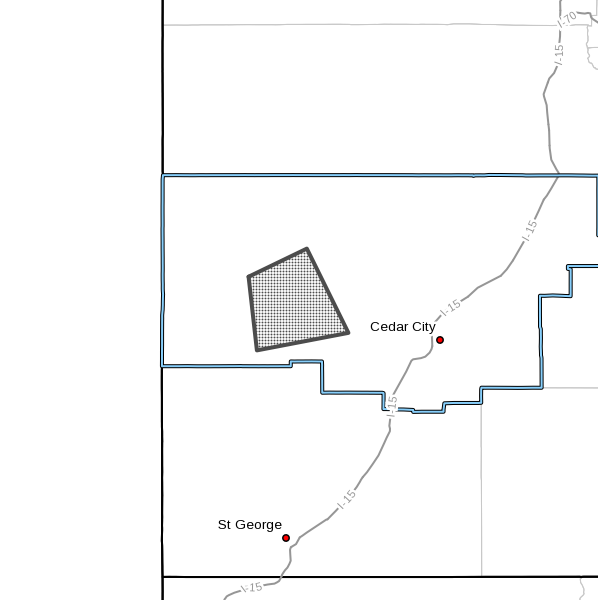 ST. GEORGE — The National Weather Service in Salt Lake City has issued a severe thunderstorm warning for west-central Iron County. This warning is in effect until 4:30 p.m. MDT. At approximately 3:58 p.m., Doppler radar indicated a severe thunderstorm capable of producing quarter-sized hail and damaging winds in excess of 60 mph. This storm was located 31 miles east of Eagle Valley or 31 miles east of Ursine, Nevada. The storm was moving south at 10 mph. This severe thunderstorm will remain over mainly rural areas of west-central Iron County. Severe thunderstorms produce damaging winds, destructive hail, deadly lightning and very heavy rain. For your protection, move to an interior room on the lowest floor of your home or business. Heavy rains flood roads quickly so do not drive into areas where water covers the road.